The client requested that a small room leading to a beautiful rooftop deck be flexible enough to accommodate children’s activities as well as function as an entry to the outdoor space. 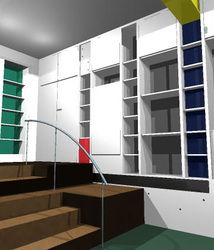 Due to the spatial limitations, a colorful composition of built-ins was created, allowing for much need storage space. Certain components such as a child’s desk can be “revealed” from the wall when needed. 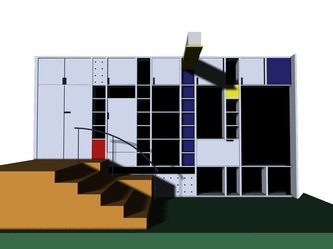 The exaggerated stairs leading to the exterior with its built-in seating became the children’s stage on which to perform.